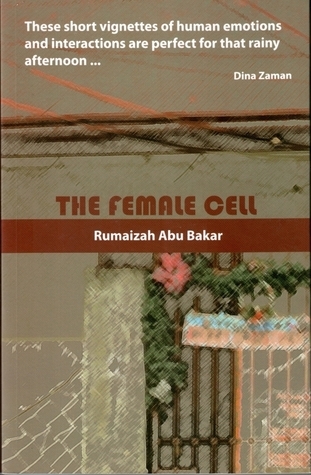 "The Female Cell" is a collection of short works by Kedah-born Rumaizah Abu Bakar, published by Silverfish Books in 2011. Do note that I use 'works' instead of 'stories'. But I'll get to that later. Like usual, I'll talk about the cover first.This book suffers from the same ailment other Silverfish titles seem to be afflicted with. I mean, the "Silverfish New Writing" titles had superb covers, but others are merely meh if not outright ugly. I love the high-grade brown paper between the covers, though, and the scent is just right.The book itself is divided into two parts: Love, Lies and Lives, and Travel Tales. In the description, the first part consists of works of fiction. Short stories, in fact.I beg to differ.The book starts off with "Christmas in July", a story about jealousy and rivalry among chefs at a hotel. Immediately after finishing the story, I went, "Eh?". However, after spending a minute thinking about it, I realized that "Christmas in July" was a freaking brilliant read. It's one of those understated stories that makes you think, and in a good way. It has a complete arc (beginning, middle, ending), and the protagonist is transformed at the end. Yu, a sous chef at one of the restaurants in the hotel, has always been denied a promotion, and has to watch younger chefs brought in from other countries rise and bask in fame. At the end of the story, Yu, who has quit the job and is now married and has two children, has opened his own business, whereas the star chef he's always been jealous of remains the same, serving the same food.Brilliant, I tell you.Then the problem starts. Just like Chua Kok Yee's book "Without Anchovies", the editor must have realized the strength of the opening story and placed it there on purpose. Good strategy, I have to say. However, it would have been better if the story had been followed up by other solid, complete stories.The rest of the first section are vignettes. Not stories, but single scenes without beginnings or endings. They feel like exercises to describe scenes the writer witnessed at that particular time. The pieces are told in the first person perspective, present tense. Actually all the pieces in this book are told the same way. There are merits, and there are drawbacks, of course. And the merits don't become apparent until the second part.I felt something was off, but I couldn't quite put my finger on it until I started reading Travel Tales. Then it hit me. Except for "Christmas in July", the narrator in the pieces is merely a witness, not an active participant. When you write a story in first-person, the reader inadvertedly assumes the identity of the narrator. Being forced to play a passive role in a story isn't a good enough experience. Just like "The Great Gatsby".Put these two factors together--single-scene vignettes and passive first-person narration--and you get a frustrating read. There isn't any character development, and as a reader I don't feel invested. And it's a shame, because Rumaizah's writing style is smooth and excellent. She doesn't pretend, and she doesn't try too hard to impress. In fact, the entire book feels like having a thirty-something lady sit across from me at a cozy cafe, regaling me with snippets of her interesting life (or interesting observation of life). The author's presence is barely felt, and I can really get lost in the tales.Especially during the second part. Oh, the second part.Travel Tales is a travelogue, pure and simple. And this is where Rumaizah shines. The pieces are still vignettes, and the style of writing is the same, with the same first-person present-tense perspective, but this time, the narrator is an active participant, and by extension, so is the reader. I have not been to a lot of these places, and traveling vicariously through these tales is awesome. I especially liked the tales of Turkey.Now. On to the technicalities of this book.I mentioned the cover. I seriously feel that Silverfish Books needs a (new) cover artist. FIXI (and its imprint FIXI NOVO) is doing a great job coming up with brilliant covers, and even the Readings from Readings series has a distinct, beautiful cover concept. Whatever is said and done, we still judge a word-only book by its cover, and using ugly covers is selling the author(s) short.This book also has the same problem as "Without Anchovies". Great opening piece, followed by a disappointing read, made more so because both these authors show an amazing potential through their opening stories.I didn't detect that many typos, but there was an abuse of the semi-colon. Especially in the first piece. And I would have appreciated less adverbs, and more strong verbs. I'm not against adverbs, but having them back-to-back can be a tad annoying.I would have gotten rid of the first part of the book (except for the opening story) and concentrated on the travelogues instead. Travel Tales is indeed an engaging read, not indulgent at all, and would have raised the author's name higher.First-person present-tense perspective is a delicate thing to handle, and doesn't work all the time. I would have appreciated some of the pieces told in the past tense, or even an active-participant third-person perspective. As it is, the narrative voice sounds exactly the same for all the pieces, and I'm quite certain the first part is told by different people/narrators.I also mentioned that the entire book feels like a thirty-something woman chatting with me across the table. What I wanted, and didn't get, was a sense of weaving all the threads into one tapestry. Even Scheherazade, with her 1001 Nights, had a bigger, more encompassing arc that tied together everything. Or Khaled Hosseini's "And the Mountains Echoed", even.This book is far from perfect, for the reasons stated above. But I will judge the author based on the first story and the travelogues. Rumaizah is a raw, unpolished gem. I believe that she will go far if she is given the right guidance and exposure.I give this book a 3.5/5. It's above average, but it's not quite there.It is, however, definitely worth the purchase and the read. I quite enjoyed reading it. I am very into plot driven stories and although the female cell is not that driven on plot, i grasped it well and managed to read the book within the day (I always read a book if I like it within the day as I cant put it down).I particularly loved the story Beads which was although short, was filled with delicate descriptions and a quick turn at the end of the story. Rumaizah's flare for description and amazing travel stories are what really got me driven to finish the book. I enjoyed the fictional stories too. This book, I feel is a good light read for anyone who would like a person's travel experience, as well as the short fictional stories. It definitly is something you can read on a warm afternoon, or in an airport, or waiting for a train/bus. Even getting your hair done. this book is entertaining, descriptive, poignant as well as down to earth. Its nice to read something normal and calming once in awhile and The Female Cell to me did that very well. I'd reccomend this book to anyone of any age, great book. Should Rumaizah keep writing and publishing more? Definitly. It will be another book by our Malaysian writers and this book is an example of our literary movement in Malaysia improving and moving further and further up. Who knows, we might go international with this book if we pushed it harder! Fantastic Job. The Female Cell is a collection of 20 short stories, divided into two parts: Loves, Lives and Lies and Travel Tales. The stories are easy and enjoyable to read; the author paints the scenes vividly with great detail and it's easy to be absorbed into the stories. I enjoyed the first part of stories from everyday life: a string of bead necklace breaks in a train; a woman wearing stilettos; a simple need for sugar and food after fasting; paranoia over a stranger. Life goes on in its usual humdrum way and then something happens... or not. As someone said, Life is what happens while we wait for something to happen. Everyday people, everyday lives but we can appreciate the details, laugh at our foibles, recognise our paranoia and prejudice in the stories. It's said literature holds a mirror to our face and that's what the stories in this book do. It's not deep though but this the author's first book. I look for more. read it and found that honest writing is fascinating! The Female Cell with a cup of coffee and few bites of macaroon will complete your evening. Thumbs up !! I was torn in between of 2 and 3 stars. But the description of "It was ok (2 stars)" and "Liked it (3 stars)" made me opted for the latter.It's not that I don't like The Female Cell. It was, well, ok. It was more like a teaser of what Rumaizah Abu Bakar can, and will be, as a literary writer.I was mostly disappointed at the lack of character development - most characters in the stories were one dimensional. Some were promising, but the moment they opened up, especially emotionally, the stories ended. Unlike the effects that I felt when savoring Unaccustomed Earth (Jhumpa Lahiri) when the stories ended with me feeling hollow inside but nevertheless literary-ly satisfied, the book appeared to me to be more of a collection of creative blog entries in which conflicts get resolved way too abruptly.I'm more into discourse when it comes to the content of a creative work, but as a human being, I do enjoy a good emotionally-driven and -charged story. However, I found The Female Cell to be lacking in both.Rumaizah, I want and expect better ones will come from you! Rumaizah Abu Bakar - Rumaizah Abu Bakar was born in Kedah. She wrote short stories and poems as a teenager at the MARA Junior Science College (MRSM) in Penang. She has a Bachelor in Accountancy degree from Universiti Utara Malaysia (UUM), a Diploma in Public Relations from the Institute of Public Relations Malaysia (IPRM) and an Diploma in Islamic Studies from International Islamic University Malaysia (UIA). She has worked for more than fifteen years in public relations, hospitality, banking, a government agency and consultancy. She contributes literary articles and book reviews regularly to a leading English newspaper in Malaysia.Rumaizah’s prose first appeared in the volume, 'News From Home', published in 2007. Her debut collection of short fictions and travel stories, 'The Female Cell', was published by Silverfish Books in April 2011 and shortlisted for the 2012 Popular Book Award. Her next book, 'A Call to Travel: Muslim Odysseys - Journeys of a Muslim Woman through Turkey, Saudi Arabia and Indonesia' was released in January 2015.